This website uses Google Analytics, a web analytics service provided by Google, Inc. ("Google, USA"). Google Analytics uses so-called "cookies", text files that are stored in your browser.The information generated by the cookie about your use of this website Usually transferred to a Google server in the US and stored there. By activating IP anonymisation, your IP address will be abbreviated by Google within the member states of the European Union or in other states parties to the Agreement on the European Economic Area To compile reports on the website activity and to provide other services related to the use of the website and the Internet against the website operator. On the site are like buttons of the social network Facebook (Facebook Inc., 1601 Willow Road, Menlo Park, California, 94025, USA). When you visit our sites, the plugin connects your browser to Facebook. If you click the "Like" button while you are logged into your Facebook account, the content of our pages can be linked to your Facebook profile. This allows Facebook You are not authorized to view this page as a part of your Web-Site. We are not responsible for any contents linked or referred to from its pages User account. 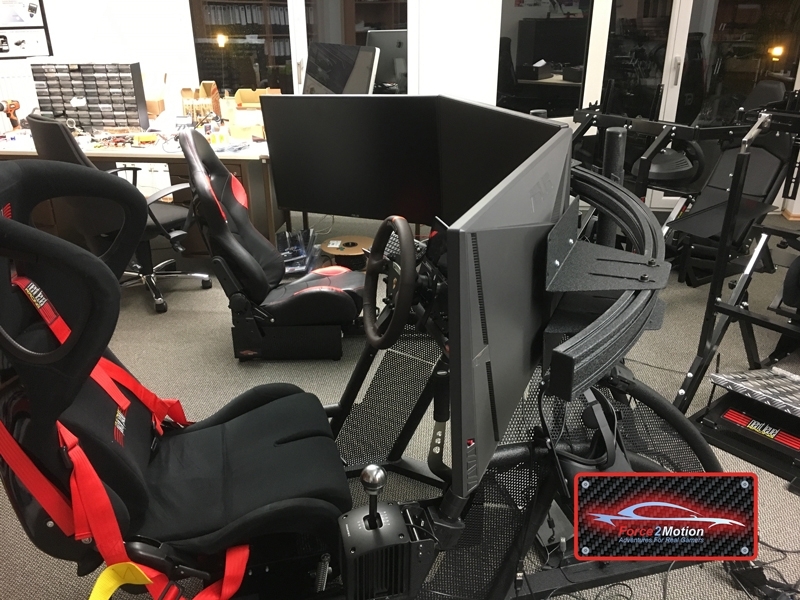 The new Next Level Racing GTtrack Cockpit presented at the SimRacingExpo 2018 can be tested in our showroom. An order is already possible here. The system is expected to be available from end of November. Pre-orders will be accepted immediately and delivered in order of purchases. First come first serve. 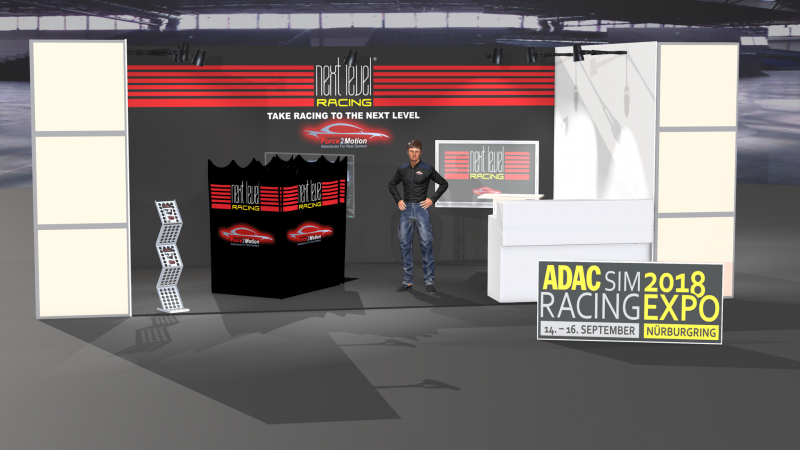 Force2Motion with world premieres at SimRacingExpo 2018 from 14th until 16th of September 2018 at the German Nürburgring. VESA-Mod for Gaming Monitors - Gaming monitors are smart and usually have a lavishly designed case. This interferes with the mounting on a vesa holder. Here is the solution. 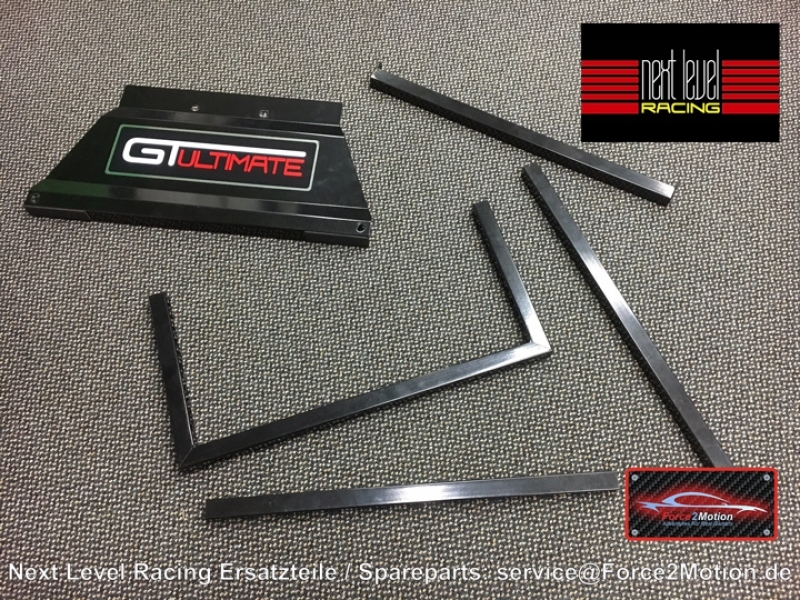 New Product: Next Level Racing Wheel Stand Lite in stock! Finally there and in time for the shopping frenzy Friday and Christmas shopping: Next Level Racing Wheel Stand Lite. The ideal introduction to sim racing. Completely Wife, Parent and Grandparent Compatible. Now in the shop for 149, - € from stock (Special offer until Easter 2018: 99,00 €). Things are finally moving: With the Next Level Motion Platform V3, the racing cockpit becomes an ejection seat. Cooling: Adaptive cooling ensures even better cooling for maximum performance. The price: The V3 costs the same as the V2. More power for the same money. The wait was worth it. Compatibility: The outside dimensions and the software support remain the same. Thus all accessories and games fit also from the V2 time. 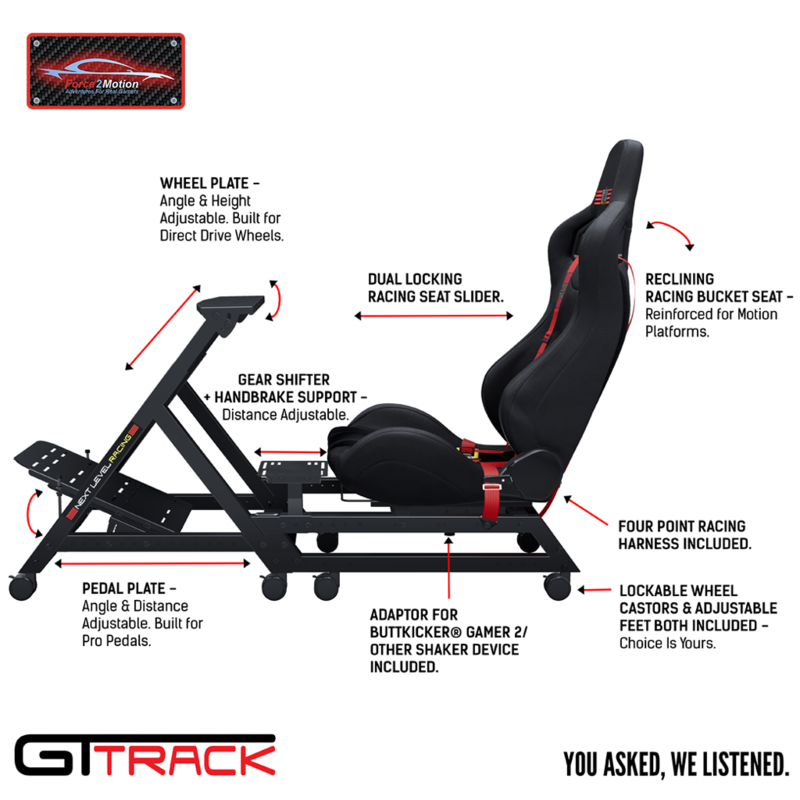 Now - All Next Level Racing products (cockpits, seats, wheel stands, monitor brackets and accessories) are available from stock. Breaking News: Force2Motion with world premieres at SimRacingExpo 2018 from 14th until 16th of September 2018 at the German Nürburgring. At the SimRacingExpo 2018 from 14.09. until 16.09.2018 at the Nürburgring we were able to introduce the new GTtrack cockpit world-exclusive with the ingenious Traction + Motion System. Only few can make the hobby into a profession. And so in our daily business we deal often with very serious issues around the IT. But we are also a little bit nerds and gamers. And we are all pretty car-crazy. The combination is to come out something quite logical: car, computer, gaming and nerd-themed inevitably lead to racing simulators, games computers and crazy DIY projects of racing cockpits and flight simulators. 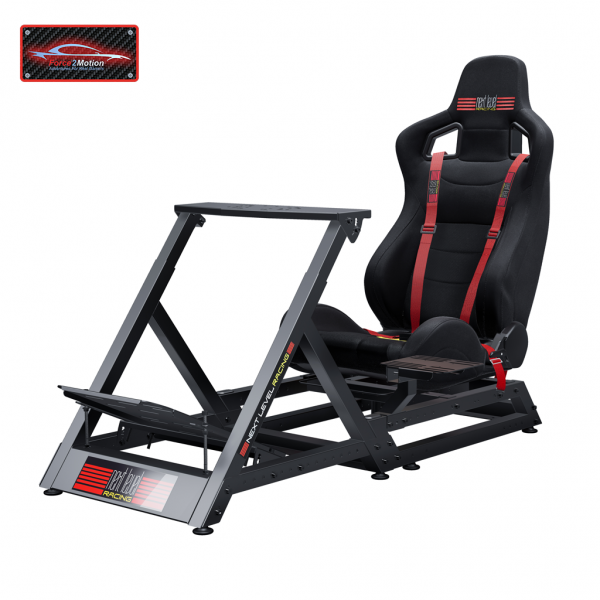 Looking for an affordable Motion Platform for the race seat we came across Pagnian Next Level Racing and the Motion Platform V3. I must have this, I thought to myself when I was pimping my gaming PC. And then: Why not make the hobby into a profession and take over the import of Germany, Austria and Switzerland? Said and done. 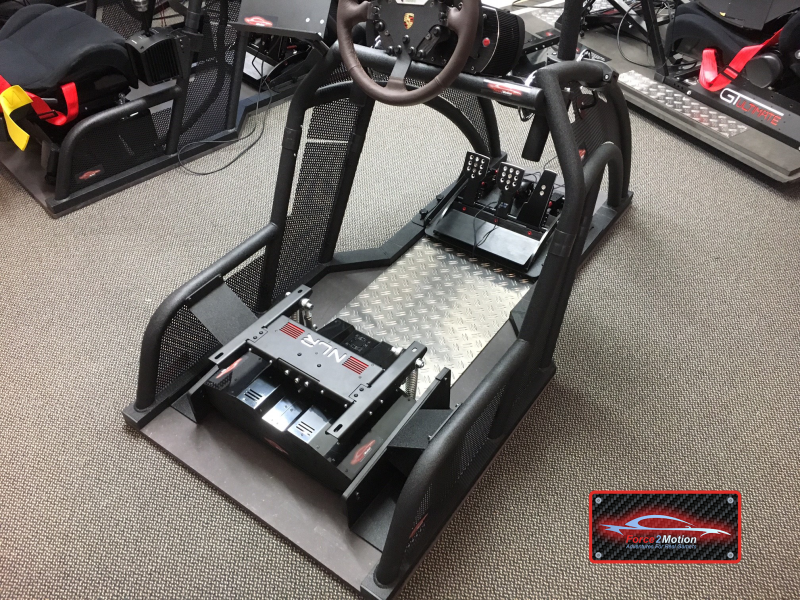 With Force2Motion we have built a new platform for racing and simulator hardware. With a variety of manufacturers and products, we offer a wide range of SIm racing and flight simulators. We started with Pagnian Next Level Racing products because: There are very few gamer world releases that rightly can be described as game changers. The Next Level Racing Motion Platform V3 is one such product. Meanwhile, Fanatec, Rseat, RaceRoom and others have also been added. 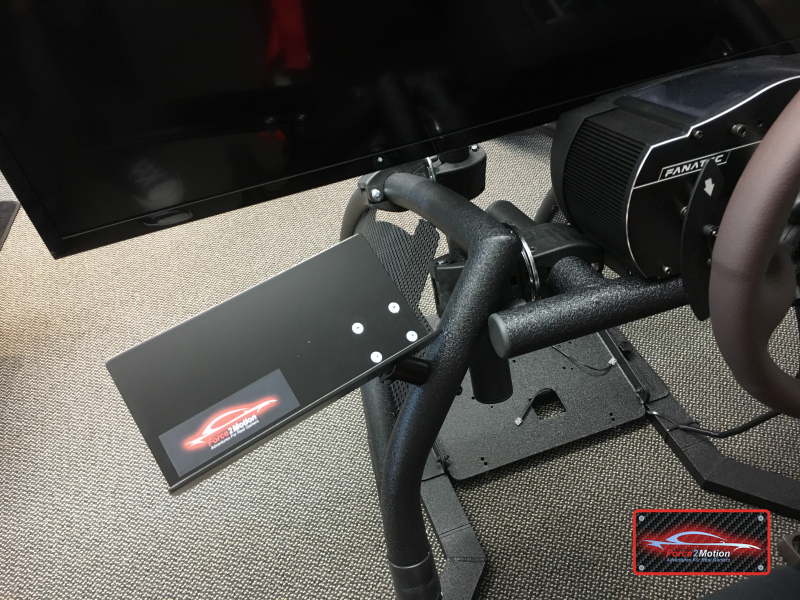 And we have developed special adapters for the Motion Platform V3, which can also be used in cockpits like the RaceRoom, the Fanatec Cockpit V2 and the RSeat N1. In our showroom in Würselen near Aachen, many of the systems can be extensively tested in subliminal configurations (one-screen, three-screen, VR) before the purchase. Simply make an appointment by phone or e-mail! You can find more videos in the menu section "Media & Videos" under "Blog & News"